Green leaves are important for everybody's health. 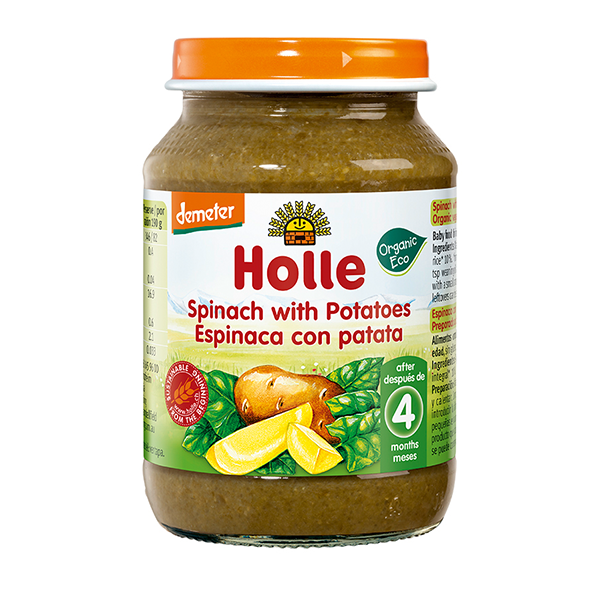 The biodynamic spinach and potatoes in this meal are just the perfect combination, ideal nutrition for your baby. To increase the availability of essential fatty acids we recommend fortifying with 2 teaspoons Holle Organic Weanng Oil, stir and slowly heat in water bath. Check feeding temperature. Water, spinach**(20%), potatoes**(10%), wholegrain rice**(10%). It is a great quality product however lost one star because it could be a bit runnier in texture. As flavours are quite strong because of spinach I always mixed it with something runnier and plain to make a lovely balanced meal.